It has thickness and length so you can work with confidence. The size feel is perfect as well. 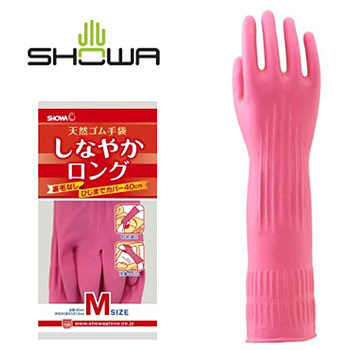 The shoulder glove and other makers' L size are too much fingers, and M size means that the thumb base becomes cramped, but this glove has a cramped sense of the thumb base even in M ​​size, reducing fatigue during work. It is recommended for those who want ML size. This review is about item#9293348. Purchased for working in the water. Usability is good, but it is a star minus one that slips a bit when sliding off the surface. It is soft and has a lot of problems. Because the length is long, sleeves are not soiled. There is thickness in rubber, while it is a long glove, it can be done very smoothly when using and removing. Supply supple long as this name. Durability is also complaints. This review is about item#09293348.